▶ Niagara Engine House No. 3: 23-25 24th St.
▶ Hope Company House No. 5: ?? ▶ Hook and Ladder House No. 6: 27 21st St.
▶ Fort Henry Engine House No. 9: 1223 McCulloch St.
▶ No. 1 Ladder Company, No. 2 Engine Company (North Wheeling): 650 Main St.
▶ Engine company No. 3 (Center Wheeling): 23-25 24th St.
▶ Engine company No. 4 (South Wheeling): 3618 Jacob St.
▶ Engine company No. 5 (Island): 128 Zane Ave.
▶ Hose and Ladder Company No. 6: 27 21st St.
▶ Engine Company No. 7, Department Headquarters: 41 11th St.
▶ Engine Company No. 8 (East Wheeling): 1614 Eoff St.
▶ Hose Company No. 9 (East Wheeling): 1223-25 McColloch St.
▶ Hose Company No. 10 (South Wheeling): 4312 Jacob St.
▶ Engine Company No. 11 (Warwood): 1609-11 Warwood Ave.
▶ Engine Company No. 12 (Woodsdale): 870 National Rd. ▶ Engine Company No. 13 (Woodsdale): 296 Poplar Ave.
▶ Engine Company No. 14 (Elm Grove): 2220 National Rd. ▶ Company No. 3: 23-25 24th St.
▶ Company No. 4: 3618 Jacob St.
▶ Company No. 5 (Island): 128 Zane St.
▶ Company No. 9 (Old No. 11): 1609-11 Warwood Ave.
▶ Company No. 10 (Edgwood): 298 Poplar Ave.
▶ 1944 Year Book, Wheeling West Virginia / sponsored by Local 12, International Association of Fire Fighters; prepared and edited by Edward H. Bubert. ▶ Wheeling Fire Fighters, 1998. 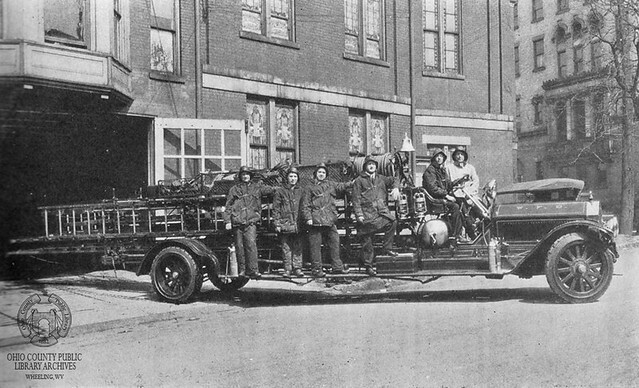 ▶ A History of Fire Fighting in Wheeling / by Robert L. Plummer and William C. Handlan, 1925, Specials Collections, OCPL Archives, non-circulating, viewing by appointment only, call 304-232-0244.